Just as I predicted, my sun came back the next day after our 1 day rain storm. Life is good! Have I mentioned how proud I am of my Daughter? She is working, working, working, so hard! She graduated High School this past Spring and is saving up to record her music and get a place with her friends. I am trying to help her obtain her goals financially, and thus far it is a success! I don't know many teenagers that are actively plugging away to their savings accounts, so we are doing something right! She works 4 days per week at a really nice high end restaurant called West. It is a great job. They pay her very well and they also have a tremendous gluten free menu! She also works 2 mornings a week at a breakfast spot. Working 6 days a week... yep, I am proud of her. The only problem is feeding her properly with such a demanding schedule. I try to make appetizers and such while I am preparing her an early dinner. Usually I need to feed her at 3pm because she heads to work at 4pm and is not home until 10pm or later. We figured out that if she eats at that time, she is well fueled for her shift. Plus we don't have to worry about her accidentally getting any gluten cross contamination. It is always just safer for her to eat at home whenever she possibly can. 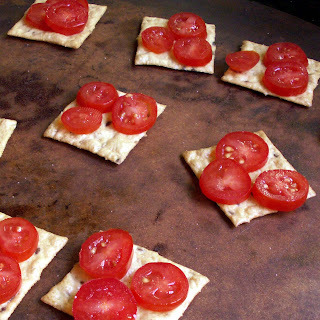 This is a delicious quick and easy appetizer to make. Today I used Crunchmaster Baked Rice Crackers. They are very crispy and tastey. An all-natural, gluten-free alternative to traditional processed wheat crackers, Crunchmaster products are packed with pure, U.S. grown rice, sesame, quinoa, flax and amaranth seeds and other natural ingredients. 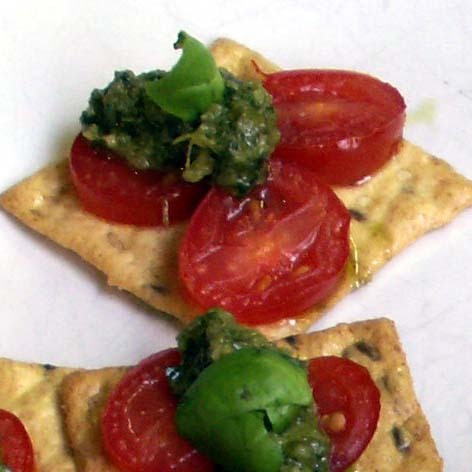 The perfect base for my Tomato and Basil Pesto Canape. 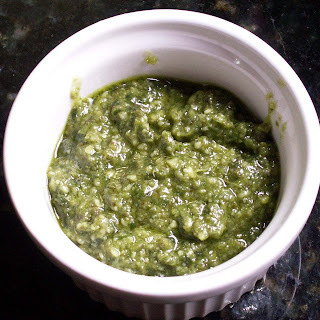 To prepare the pesto, place all ingredients for it in a food processor and pulse until combined to a smooth, thick paste. 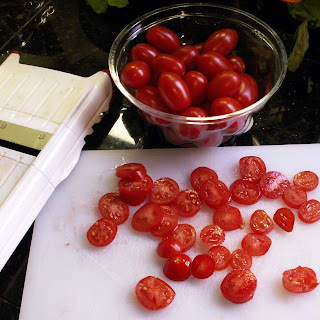 Cut the cherry tomatoes into slices, allowing for 3-4 slices per canape. I used my mandoline to make the perfect slices. Arrange 3-4 tomato slices on each canapé and then place in the oven and bake for 10 minutes, until golden brown and crisp. Take out the canapes, top each with half a teaspoon of the pesto and serve immediately.